The Inspector General Assam Rifles (South) designate Major General KP Singh called on Manipur Chief Minister Nongthombam Biren Singh on Thursday. Major General Virendra Singh, Head of Assam Rifles in Manipur and Inspector General of Assam Rifles (South) were also present on the occasion, according to official sources. Inspector General of Assam Rifles (South) is responsible for ensuring security as well as for countering insurgency in the Manipur State, stated Assam Rifles(South) spokespersons in a press release. Inspector General met on the occasion of relinquishing his command to the incoming General Officer, Major General K P Singh. 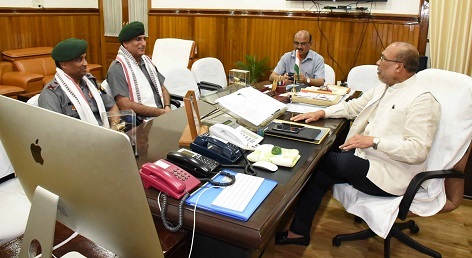 During the meeting, the General Officers discussed the security and law and order situation in the State with the Chief Minister and assured him of the Assam Rifles commitment to working towards bringing lasting peace in the region. General Virender Singh, while conveying the untiring support of his forces for ensuring the well being of the State, emphasized on the fact that a vast majority of the Assam Rifles are from in and around Manipur, the release said. Being sons of the soil themselves, they are passionately contributing towards advancement of the State in their own sphere of work. Besides assisting the civil administration in maintaining peace, they are mainly focussed on empowering the children, women and youth of the State to attain financial sustainability and a secure future, the release said. The Assam Rifles is also making a concerted effort towards harnessing the immense talent available in the State in an array of different sporting activities and in the field of art and literature. This is being done by providing them with guidance, counselling, training and suitable platforms to showcase their talent, it added. The close coordination and interaction between the State Government and security forces was highlighted and well appreciated by both the Chief Minister and the military Generals.